Shine Music School opened in January 1993 in South Africa. It was founded by Prof Strahinja Sajin and today the school has a large staff of experienced teachers who teach a wide range of instruments from Piano and Guitar to Drums and Saxophone. In 2008 the Barcelona branch of the Shine School of Music was opened by Prof Sajin’s son Milos Sajin in Spain, with the primary goal of providing quality Guitar Classes in English, Spanish and Catalan in all styles of guitar. Today the Shine School of Music Online provides students world wide with quality music school lessons from our handpicked professional music instructors. Hundreds of students pass through our school every year where each students individual musical requirements are nurtured by our staff of qualified teachers and musicians. The nature of one-on-one lessons with a trained, professional teacher, puts our students ahead of those who study through online downloads or books. Having someone on hand to instruct, correct and encourage students means that the student masters the instrument faster, and enjoys the experience of learning the instrument. Now our team of teachers can teach you too, no matter where you reside. This offers a valuable opportunity for you to learn from specialized teachers, as well as unique styles of instruments from the comfort of your home. 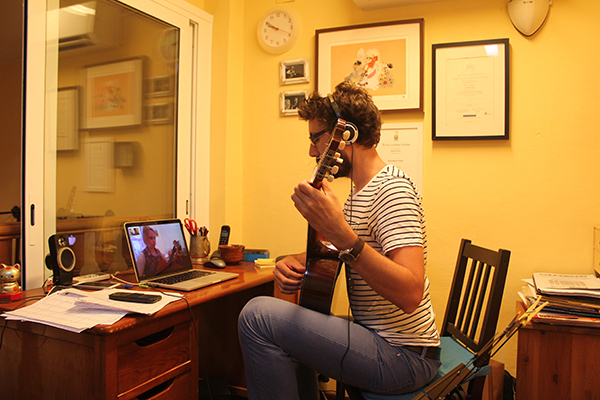 No longer will you struggle to find a local flamenco teacher, or have to travel for long distances for your Contemporary Blues or Ukulele lessons. The Shine Music School Online offers a full range of methods, styles and instruments, fostering a love of music with students of all ages and all levels. Don’t hesitate to contact us now to book your first online lesson. We offer Trial Lessons!